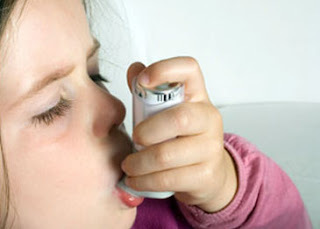 Young infants may be more likely to develop allergic asthma if they lack four beneficial bacteria in their gut, according to a study published in the September 30 issue of Science Translational Medicine. Children with lower levels of Lachnospira, Veillonella, Faecalibacterium, and Rothia bacteria in their gut in their first 3 months were at higher risk for asthma and tended to receive more antibiotics than healthier children before they turned 1 year old, report Marie-Claire Arrieta, PhD, from the University of British Columbia in Vancouver, Canada, and colleagues. In a follow-up experiment in the study, adult germ-free mice who received an infusion of these four bacteria had offspring with less airway inflammation and less asthma. The authors note that asthma risk has previously been linked with various environmental factors, such as antibiotic exposures, cesarean birth, formula feeding, and not living on a farm. "The microflora hypothesis suggests the intestinal microbiota as the link between these environmental changes and our immune system, and many recent studies have identified the intestinal microbiota as a potential therapeutic target in the prevention of asthma and atopic disease," write Dr Arrieta and coauthors. "Our findings indicate that in humans, the first 100 days of life represent an early-life critical window in which gut microbial dysbiosis is linked to the risk of asthma and allergic disease," Dr Arrieta and colleagues write. "Further, our data also show that these gut microbial changes are much less apparent by 1 year of age, suggesting that therapeutic interventions to address microbial dysbiosis would need to occur very early in life." They add that "the fact that [Lachnospira, Veillonella, Faecalibacterium, and Rothia] supplementation was protective and induced a marked reduction in lung inflammation in mice emphasizes that these taxa are immunomodulatory and involved in asthma."